Frustrating. That's the way that Crook County High School head football coach Ryan Cochran described the 2018 football season. "I'm extremely frustrated," he said. "Frustrated for our guys. Our league was extremely tough, with three teams in the top 10 when we played them. We played them really close games, but it's obviously frustrating to miss the playoffs." Despite just a 3-5 overall record and a 1-4 league mark, the Cowboys were in the hunt for a post-season game until the final play of their 28-20 loss to Estacada that closed out the regular season. 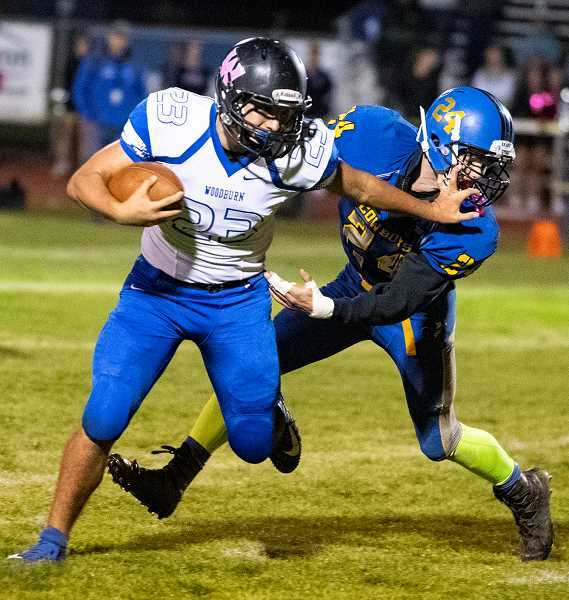 Crook County was the final team eliminated from post-season play, finishing just .07 of a percentage point behind Baker, who earned the final play-in position, in the final OSAA Class 4A power rankings of the year. Baker went on to win their play-in game, before falling to the eventual champion Banks Braves in the first round of the playoffs. Meanwhile, Crook County was left wondering what might have been. The Cowboys played six teams that reached at least the first round of the playoffs, including Gladstone, which reached the state semifinals. Crook County was in all six of those games, defeating Ridgeview, which reached the first round of the Class 5A playoffs, and North Marion, which reached the first round of the Class 4A playoffs. However, a two-point loss to Woodburn and eight-point losses to both Gladstone and Estacada proved costly to the Cowboys. "I'm proud of our guys that they kept battling every week and every game," Cochran said. "They never gave up. Every team we played, we played to the very last play." Cochran noted that he was especially pleased with the leadership that he saw from the Cowboys' leadership team. "Our leadership never died off," he said. "No matter our win-loss record, and that was awesome to see. Those guys battled every day, and our practices didn't fall off. Our leadership and our team just kept pushing and trying every day to get better, and I think that's what kept us in those games." Cochran noted that it was little things that proved to be the difference in earning wins and losses during the course of the season. The team made a number of small mistakes and was plagued all season with penalties. "We were so close in so many of our games, and it was coming down to the little things," he said. "We need to focus on our execution moving forward, and those little things, like penalties, just killed us this year." Not having the success that the team had hoped for was a bitter pill to swallow, especially with so many close games. The Cowboys lose 14 seniors to graduation, including most of their offensive and defensive line. Gone will be linemen Carson Smith, Erick Gonzalez, Colton Schlachter, Caleb Parrott, Riley Aikins, Jaxson Rhoden, Tyler Humeston and Jason Tayor. Also lost to graduation will be linebacker Jason Slawter and defensive backs Jacob Kleffner, E.J. Allen and Elijah Becker, along with all-league receiver and defensive back Dominic Langley. Cochran was quick to note that those seniors will be difficult to replace. "I appreciate all of our players, especially our seniors — how hard they worked this year," Cochran said. "Even though we didn't finish where we wanted to in post season, I was proud of their efforts. Obviously, our seniors, we hate to see them go, but we are excited to see all of the things that they have ahead of them." Cochran was quick to add that although the seniors will be difficult to replace the team has a lot of experienced players returning. "Our younger guys have some big shoes to fill," he said. "But there are a lot of younger guys that got lots of varsity time. We've got quite a few guys coming back. We have some big holes, but there are also guys that are coming back that we can definitely build on." Those returning players include starting quarterback Brody Connell and running backs Ethan Cossitt, Clayton Berman, Kaden Horton and Kyle Knudtson along with wide receiver Garett Bernard. Cochran said that in order for the team to improve on their record next season, they will have to find a way to replace their line as well as improving the team's execution. "We need to work on playing with consistency, playing with a sense of urgency," he said. "We need to be constantly striving to become better." The football coaches are encouraging all of their returning players to go out for at least one additional sport in order to work on their athletic ability as well as asking players to spend time in the weight room. "We are going to be pushing getting in the weight room," Cochran said. "Getting bigger, faster, stronger, those are the sort of things that are going to put us over the edge. We are definitely going to focus on those little things that seemed to be what came and bit us this year."